← Where on the Internet is Jeremiah Stanghini? Today, in the US, is Martin Luther King, Jr. Day. While it was originally an American holiday, the day is observed outside of the US, one of those places being Toronto. Having grown up in Canada, I did not hear much about MLK Day in school. The schools in the Toronto area now, I’m sure, are much more likely to be telling their students about MLK Day when it rolls around each January, but that wasn’t the case when I was growing up. 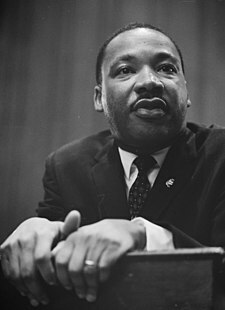 While attending university at SVSU, MLK Day was quite a hot topic, especially around this time of year. At the time I attended SVSU, MLK Day was not a holiday where the school was closed. The argument against closing the school for the day was that students would not take the time for learning or for reminiscing, to which the counter-argument would be, do students do that for any holiday? Something that may get lost in all of the to-ing and fro-ing in the argument about MLK Day and whether or not it should be a holiday is the real impact that MLK had on the course of history. I was reading on Annie Leonard’s Blog this morning, the person behind The Story of Stuff Project, about MLK’s first endeavor into service. I wonder what his life would have looked like had he not decided to get involved with the bus boycott. Maybe he still finds his way into the Civil Rights Movement and makes a difference. Maybe he still gives the I Have A Dream… speech. Who knows. It is really hard to reflect on different timelines of how history could have played out because those timelines don’t exist. I wonder where the line is drawn? Sometimes, reflecting back on past experiences can be inspirational. Maybe you had to overcome major adversity in your life and that memory is helping you in the present. Depending on one’s philosophical viewpoint, it can be altogether difficult to reconcile the differences. Regardless, I will be spending at least one of my ‘present moments’ celebrating the life of Martin Luther King, Jr. This entry was posted in History and tagged Eckhart Tolle, Holiday, Martin Luther King Jr, Martin Luther King Jr Day, Present Moment. Bookmark the permalink.